Red Bull and Singha area few of the most well known, but there’s no drink more famous than Cha Yen, or known throughout the world simply as Thai iced tea. This sweet creamy beverage, that hardly even resembles a regular cup of black tea, is loved in Thailand and served at Thai restaurants around worldwide. If you enjoy sweet and creamy drinks, there’s hardly a more refreshing and drink option available for you. I used about 1 tablespoon of tea leaves for this recipe. There are a number of different ways you can steep your tea leaves, but the point to remember is you just need to steep them in hot water for a few minutes until you tea is nice and dark orange in color. I used a tea sock, but you can even just toss your leaves into a cup of hot water, leave it for a few minutes, and then strain out the leaves. 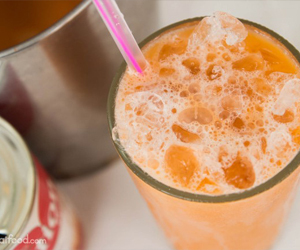 Thai iced tea is always prepared hot, and yet it’s consumed cold on ice. But rather than sticking it into the fridge or freezer and cooling the tea off, it’s instead poured over a cup of crushed ice before being consumed. When you make your tea, if you taste test it when it’s still hot, you want it to be a little stronger and sweeter than you like it, and it will become diluted as soon as it hits the ice.